In accordance with the GRI G4 framework for sustainability reporting, a materiality process was used to determine the topics that were most relevant for our report. This process aims to identify the range of issues that were most important to Transurban and its stakeholders in FY15. Once Transurban’s activities and risks for each aspect were identified, a rating process was undertaken to ensure that the most relevant issues were included in the report. This rating was based on an assessment of the level of stakeholder interest in the issue being reported, and the potential consequence of an issue to Transurban. A visual representation of the issues rated is shown below. These issues are based on GRI categories, and are rated based on Transurban’s activities in each category for FY15. ‘Level of stakeholder interest’ and ‘potential consequence to Transurban’ takes into account the relative prominence of each topic in 2015. Many topics were rated as not material for the FY15 report. This does not imply that they are not important; it merely recognises that they were less material in FY15 in terms of interest and impact on the business. Nonetheless, many issues that are not material are reported upon each year by Transurban as a matter of consistency. Stakeholder interest in the content of the report was based on feedback from existing engagement activities on major topics and projects during the year. Refer to the ‘Stakeholder Engagement’ section for an overview of many of these activities. There was no formal stakeholder engagement that was specifically related to the sustainability report itself. Transurban will seek to improve this for future reports by making specific contact with stakeholders regarding what they would like to see in our sustainability report. Potential consequence to Transurban was based on our corporate risk rating matrix which measures risk in a number of categories including financial, community, health and safety, environment, property loss and security, business interruption and legal and compliance. Our material issues were also reviewed to identify which part of our organisation’s ‘value chain’ they were most relevant. 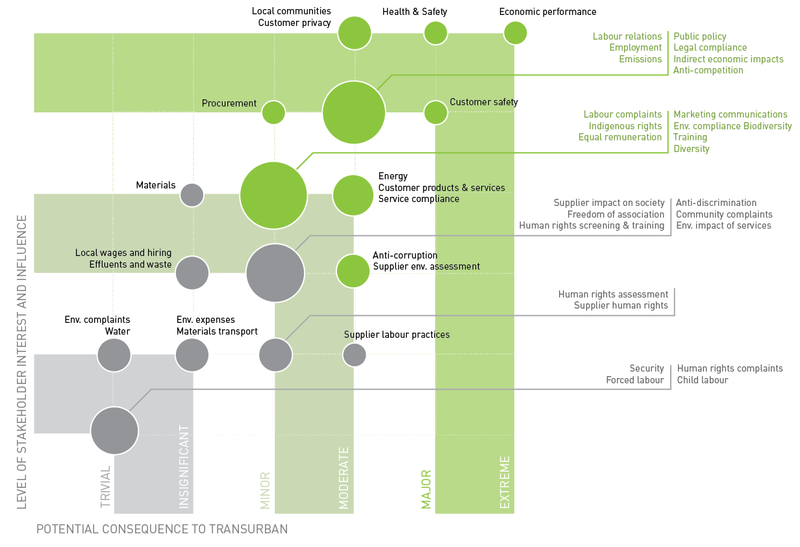 The value chain diagram below represents a simplified summary of Transurban’s major stakeholder groups and business drivers (from “upstream” government and industry drivers, to Transurban and its direct suppliers and customers, to “downstream” community and environmental outcomes). 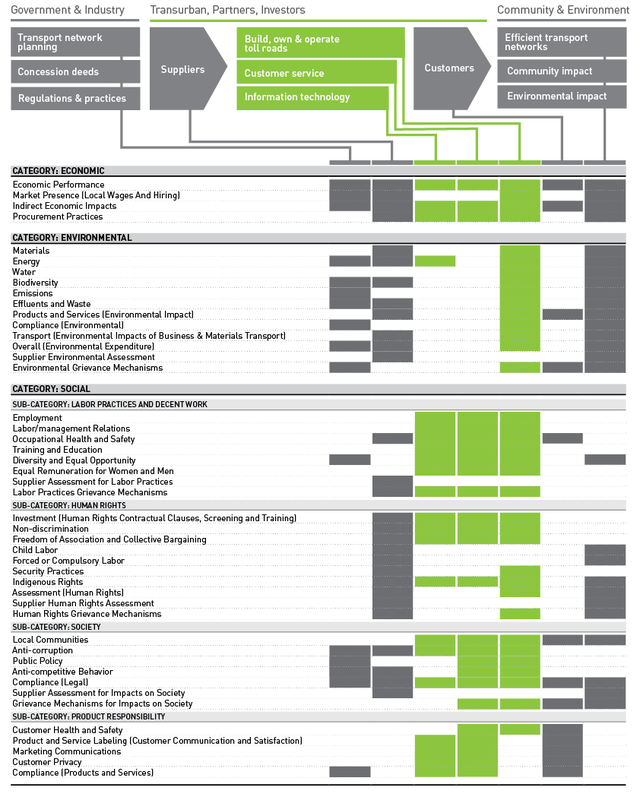 Shaded areas in the table represent the parts of the value chain most relevant to each reporting aspect. For example, customer safety is of greatest relevance to our road operations, customer service and customers. Other issues such as our indirect economic impact are highly relevant to all stakeholders across government & industry, suppliers, Transurban, customers and the community. This table is another way to map the most relevant stakeholders and business drivers affected by each sustainability issue.